Now here is a budget UK brand that has caused quite a stir amongst beauty bloggers already – MUA Makeup Academy. The key point about MUA is that every item in the range is currently £1. For £1 you could purchase any product from the range shown on their site. They also offer pressed powders which aren’t yet shown on the site and they very recently introduced some rather nifty brow pencils and pencil eyeliners into the range. If you – like I was initially – are still doubtful of the quality of the range then I’ve included a quick overview of some of the eye products I own that I use very regularly! I’m beginning with my favourite eyeshadow shades as it was the eyeshadows that first drew me to the range. Although I first selected a matte and neutral shade, MUA has gained a lot of popularity for the vibrant pigmentation of the shimmer shades on offer. Shade 9 is a bright purple duo-chrome shade which gives an intense colour payoff. 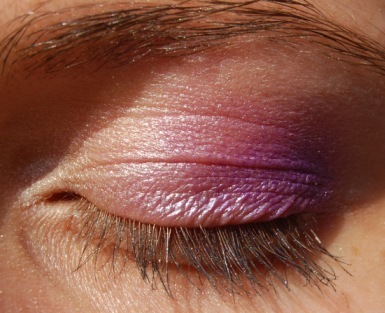 The eyeshadow is probably better used with a brush and is nice and blendable. This shade is beautiful and works nicely with the pale pink/lilac shade 4. Shade 1 is an extremely shimmery white that works well as a highlighting colour to wear on the inner corners of the eyes and set off other shades. I literally use this daily as it is subtle when applied sparingly but can be built up easily for more vibrant looks. If there are negatives I can say that the eyeshadows do crease somewhat after several hours when applied heavily. For evening looks they can migrate after a night out but I still opt to use them for both daytime and evening looks as I find the colours so enticing! I imagine that with a decent base of primer these eyeshadows would last much longer. Also as a slight negative, the lid of my shade 1 eyeshadow recently broke at the hinge and now rarely stays on... but I think that’s probably through such regular use and transportation in my bag as all my other lids remain intact! The mascaras I own by MUA are shades 1 and 5. Shade 1 is a clear mascara (that I usually use as an eyebrow gel) and shade 5 is black. Although I have never been able to achieve very extreme or dramatic results with shade 5, I still like it. 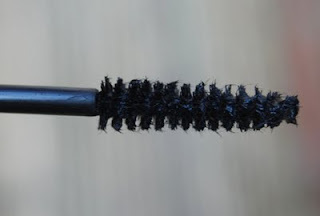 The very soft brush allows for more subtle layers of mascara and I find it is easy to avoid clumping whilst still notably defining my lashes. Shade 20 is a matte black eyeshadow which is a good staple for any collection. With just a little of the shadow it is easy to achieve a very dark and smoky effect. Although the matte brown (shade 19) and matte purple (shade 18) have never really worked for me and don’t seem to have very impressive pigmentation, shade 20 is a knockout. Despite the fact that the products only cost a small amount, it is obvious that a lot of thought goes into the design in this range. The brow products have a comb at the end whilst the brightly pigmented eyeliner pencils have a sharpener built into the lid. Another nice touch to these latest products is the addition of shade names. I had debating buying a white eyeliner pencil for a while so when MUA released theirs I snapped up "Snow white" immediately. For £1 I got a creamy, long-lasting liner that I’d highly recommend for those experimenting with more dramatic looks. I’ve been tempted by some of the other shades in the range after trying this pencil out. For tamer looks there are some delicate pastel shimmers on offer; but I’m tempted more by the royal blue and vibrant orange offerings! The brow pencils so far only come in 2 shades – a lighter caramel shade for blondes and a deeper brown for brunettes. I own the blonde shade (unsurprisingly) and found it did indeed bring quick and lasting results. For me, the brow pencils are best used sparingly and blended out due to my rather fine brows and the distinctive pigmentation of the pencil. When used with caution, you can still achieve satisfactory results! One of the exciting things about MUA is that in the year the products have been available, the range has evolved greatly. In Superdrug’s DARE magazine recently there was a photograph of a new MUA professional range eyeshadow trio that caused quite a stir. 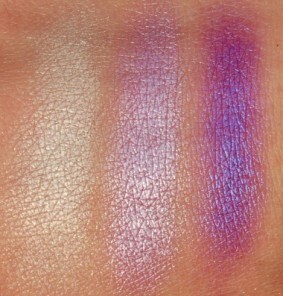 Similar in appearance to a Bourjois eyeshadow trio, the MUA trio was shown in the shades of bronze, blue and grey. According to MUA on facebook, the range will contain many new products priced £1.50-£4 including the £2.50 trios, new nail polish shades and a face primer. The most expensive item will be a 12 shade eyeshadow palette at £4. Thank you to the wonderful Emma for helping me photograph these products and let me say that I for one am very excited about the new range! It does! I've just been out for about 6 hours in the sunshine and it hasn't budged. I've recently bought my first MUA shadows and really impressed. Deffo want to try and find number 9 after seeing this - it's gorgeous! Number 9 is the standout shade from the collection for me. One day I'll probably end up owning all of them.